Back in 2013 the 17.5 spec racing class was tossed into turmoil overnight. ROAR, the U.S. sanctioning body had announced that the D3.5 17.5 motors, which has been approved, were no longer legal for ROAR events. Just like that, tracks that follow ROAR rules would ban the use of the motor while some tracks understood that people purchased these motors and they wanted to use them for racing let them continue to use them. After the lawyers got involved a sensible agreement was reached and the decision to allow the D3.5 motors for ROAR events was approved until the first part of 2014. 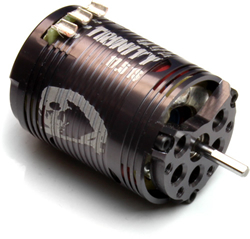 In late June, 2014, Trinity released the D4 motor to replace the D3.5. Since that time, the D4 has powered cars to 8 ROAR National “Spec” Championships. In early January, the D4 1S motor was released. The major difference between the two motors was the length of the stack which the wires are wrapped around. Having purchased this motor, part number TRI1702RM, from my LHS I decided to take a closer look to see what made this motor so special. The D4 1S motor measured 19.4 mm in stator length which is .1mm above the new ROAR rule of 19.3mm. This motor came with the TRI1112 Hi-Torque Rotor, which is 12.5mm in size. Out of the package, the motor timing was set at 50 degrees based on the markings. A sensor wire is also included in the package along with some directions, but most guys don’t read maps let alone directions. A quick test on the G-Force Motor Analyzer tool revealed that the timing was actually off by about 5 degrees from the markings on the can. That doesn’t mean anything about the performance of the motor but only as a reference point for myself. The actual sensors had a difference of 4 degrees among them which is pretty good considering the pick and place machine having to place a 3 small components on the board along with the tolerance level of the analyzer tool itself. The sensor board is easy to replace in case the unthinkable has happened. As with most motors, you remove three screws and the motor comes apart. One thing that can be said with this motor is that the sleeve surrounding the stator can be removed and replaced by an optional piece that allows you to mount a fan to it. Electronics run better the colder they are. That is why you are starting to see fans mounted in off-road cars and fans have been used for on-road cars for a while now. As I mentioned, this motor came with the Hi-Torque Rotor TRI1112. 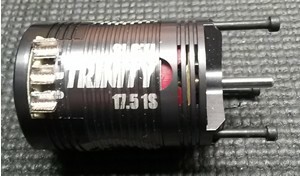 One thing that makes the Trinity rotors unique is the colored end piece on the rotor. 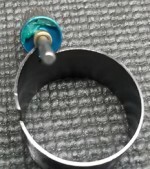 The Hi-Torque Rotor has a teal end so you can quickly identify it when it is sitting in your motor box. Just be sure to keep it away from magnetic items because they will attach themselves quickly and yes I am speaking from personal experience. A quick test on the I-Gauss showed a reading of 1515. I suspect that they keep the higher rotors for those 5% run of rotors but I could be wrong but this is still a good reading. This rotor is epoxy balanced as opposed to drill balance. My personal preference is that the rotor itself is balanced by drilling but I am not going to shy away from an epoxy balanced rotor, provided the method used to balance the rotor has been done properly. Once assembled (well kind of assembled), I can see the distance between the rotor and the sensor board (see picture). In my opinion, the farther away the sensors are from the rotor the harder it will be for the sensor to read the positioning of the rotor. 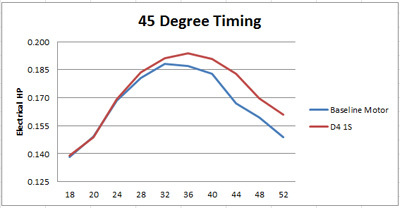 How this affects performance is for a different article but what I will say is that a motor does not run very well if the rotor is rubbing up against a sensor. I always test fit the motor assembly, minus the stator, to see if they will come in contact with each other. Up next is the internal resistance reading of the wire in the stator. Since this is considered a short stack motor the resistance reading will be lower than a non-short stack motor and it is but where I am most concerned about is the reading differences of A, B, and C. This motor showed to have a difference of .3 on my meter. Considering how our motors are designed, it is almost impossible to get them to be the same from the manufacturer unless you take the time and wind your own. Since this motor was purchased over the counter I will accept that difference. So how does it perform? Well, for this article I have a base lined a motor to compare the performance. I have used this motor to propel my off-road cars to many TQ and hot lap times so I know it isn’t a slouch but it is well used so keep that in mind and with it being replaced soon I wasn’t about to buy a new one. Ok, back to the D4 1S motor. I don’t normally run the base lined motor at 35 degrees (measured by the G-Force Motor Analyzer) but I wanted to do a comparison of power with both motors having the same timing. Here you can see the D4 1S provides more electrical power starting at 20 amps and carrying it over to 52 amps. Things start to get a little interesting here at the 40 degree setting. The base lined motor has more electrical power at the lower amp draw but eventually its curve flattens out and is overtaken by the D4 1S motor in the higher amp draw. This higher amp draw usually occurs from a standing start or when you accelerate out of corner. This also confirms the feeling I experienced when I ran this motor in my buggy, it seemed to accelerate faster than the base lined motor did. Now here we see where the D4 1S starts to pull even at the lower amp draw but still maintains its supremacy at the higher amp draw. You should also notice that the curve is starting to look more like a peak as opposed to a slow climb up and down, aka flatter. Now we take a look at the 50 degree timing mark and we see similar results as we have seen earlier. Notice that weird results in the 20-24 amp range, well I think that is just an abnormality when I ran the test so I wouldn’t pay all that much attention to it. We do continue to see the roughly the same gap in the higher amp draw at 50 degrees as we seen in the 45 and 40 degree charts. How did I calculate Electrical HP? Well there is a formula for this and I used [(E x I x Eff) / 746]/100. The last divide by 100 was to get a % but really it isn’t needed as long as you stay consistent in your calculations. “E” stands for voltage, “I” stands for current, and “Eff” stands for efficiency. So what does all of this mean? This means that this motor has more power than my old trusty fast base lined motor that I have so that means I should be faster on the track. This is true just so long as I find the right gearing to deliver this power. 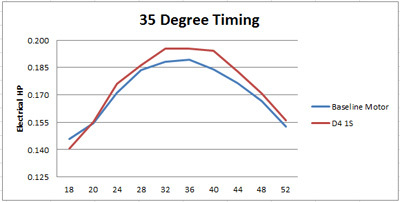 These graphs are only part of the equation since you also need to select the right gear for the RPM and Torque values at that timing. After a few runs on the track I was able to find the gearing and I did put in a faster run than my base line motor. In fact, I was able to reset my personal best on the track. My car, Kyosho RB6 has a 4 gear transmission in it, and this motor seemed to provide more punch coming out of the corners than my other motor. It almost felt like I was running a 3 gear but it was not quite the same feeling as having a 3 gear transmission in the car. The motor ran cool even when I had the wrong gear for the amount of RPM and Torque the motor had. How did I know I had the wrong gear? By listening to my car accelerate and the lap times of course. I always gear for lap times and not temperature. So where am I going with all of this? Good question! I have acquired a few motors recently and put them through their paces both on the dyno and the track. As I continue to get more motors and run them through I am going to use the D4 as the bench mark going forward. I felt that motor offered me a better chance to go faster than my original motor that I was using as a bench mark. In addition, Trinity recently announced the 24K motor and I can’t wait to get my hands on one of those to see how it compares against the D4. I have been involved in R/C since the early 90’’s. I have participated in dirt oval, carpet and paved oval, on-road and off-road racing. I have found ideas that work and ideas that seem to be good on paper but fail for one reason or another. I have been involved in the rules decision process and tech inspection for one of the largest indoor on-road only events held in the U.S.